Pottery from the prehistoric Jōmon period in Japan is thought by many scholars to be the oldest ever discovered. Prehistoric art of Japan begins with the Jōmon period (c. 10,000 BCE – 350 BCE), and the Jōmon people are thought to have been the first settlers of Japan. The Jōmon people are named for the “cord-markings,” or decorative impressions made with rope, found on pottery of this era. Jōmon pottery is said by many scholars to be the oldest ever discovered. In the Middle Jōmon period (3000-2000 BCE), simple decorations on the pottery gave way to highly elaborate designs; flame vessels and crown-formed vessels are among the most distinctive forms from this period. Clay figurines called dogū , often described as “goggle-eyed,” featured elaborate geometrical designs and short, stubby limbs; they are believed to have a religious or ritual significance. cord-markings: Impressions made with rope, found as decorations on pottery of the Jōmon period. dogū: Clay figurines crafted by the Jōmon people of ancient Japan. Prehistoric art of Japan begins with the Jōmon period (c. 10,000 BCE – 350 BCE). The Jōmon people are thought to have been the first settlers of Japan. Nomadic hunter-gatherers who later practiced organized farming and built cities, the Jōmon people are named for the “cord-markings”—impressions made by pressing rope into the clay before it was heated to approximately 600-900 degrees Celsius—that were found as decorations on pottery of this time. The term Jōmon was first applied to the pottery and the culture by American Edward Sylvester Morse. Jōmon pottery is said by many scholars to be the oldest ever discovered. The Jōmon communities consisted of hundreds or even thousands of people who dwelt in simple houses of wood and thatch set into shallow earthen pits to provide warmth from the soil. They crafted lavishly decorated pottery storage vessels, clay figurines called dogū, and crystal jewels. The oldest examples of Jōmon pottery have flat bottoms, though pointed bottoms (meant to be held in small pits in the earth) became common later. In the Middle Jōmon period (3000-2000 BCE), simple decorations on the pottery (created with cord or through scratching) gave way to highly elaborate designs. So-called flame vessels, along with the closely related crown-formed vessels, are among the most distinctive forms from this period. 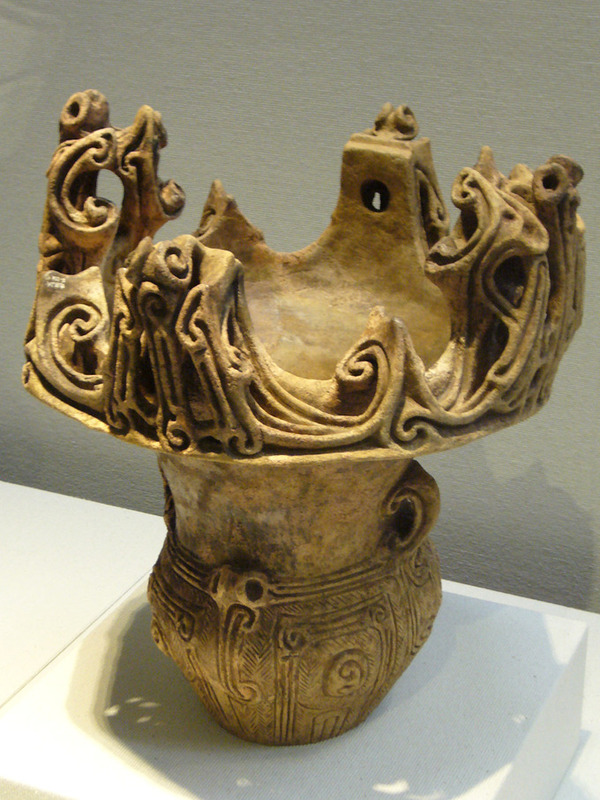 Crown-formed vessel from middle Jōmon period (3000-2000 BCE): “Crown-formed vessel,” a variation on the flame vessel style for which Jōmon art is famous. Representative forms such as clay figurines of people and animals also appeared around this time. These figurines, called dogū, are often described as “goggle-eyed” and feature elaborate geometrical designs and short, stubby limbs. They are believed to have borne a religious or ritual significance. A Final Jōmon Statuette (1000-400 BCE): An example of Jōmon dogū. Artifacts brought to the Japanese islands by the Yayoi people bore Chinese and Korean influences and ushered Japan into the Iron Age. Discuss how Chinese expansion under the Qin and Han Dynasties contributed to migrations to the Japanese archipelago during the Yayoi period. The Yayoi people arrived in Japan around 350-300 BCE, bringing knowledge of wetland rice cultivation, the manufacture of copper weapons and bronze bells, and wheel-thrown, kiln-fired ceramics . Artifacts brought to the islands at this time had a powerful effect upon the development of Japanese art by presenting objects to imitate and copy, such as bronze mirrors and swords in the Chinese and Korean styles . Yayoi period pottery tends to be smoother than that of the earlier Jōmon period and more frequently features decorations made with sticks or combs rather than rope. Three major symbols of Yayoi culture include the bronze mirror, the bronze sword, and the royal seal stone. Yayoi craft specialists also made bronze ceremonial bells, known as dōtaku . Iron Age: A level of culture in which man used iron and the technology of iron production. dōtaku: Ceremonial bronze bells of the Yayoi people in Japan. The Yayoi period is an Iron Age era in the history of Japan traditionally dated 300 BCE to 300 CE. It is named after the neighborhood of Tokyo where archaeologists first uncovered artifacts and features from that era. Distinguishing characteristics of the Yayoi period include the appearance of new Yayoi pottery styles, the start of intensive rice agriculture in paddy fields, and a hierarchical class structure. Techniques in metallurgy based on the use of bronze and iron were also introduced to Japan in this period. The Yayoi followed the Jōmon period (13,000–400 BCE), and Yayoi culture flourished in a geographic area from southern Kyūshū to northern Honshū. Archaeological evidence supports the idea that during this time, an influx of farmers from the Asian continent to Japan (known now as the Yayoi people) absorbed or overwhelmed the native hunter-gatherer population. Chinese expansion under the Qin (221-206 BCE) and Han (206-220 CE) Dynasties is said to have been a primary impetus for migration to the Japanese archipelago . The Yayoi brought their knowledge of wetland rice cultivation, the manufacture of copper weapons and bronze bells (dōtaku), and wheel-thrown, kiln-fired ceramics. Along with introducing bronze casting and other technologies into the islands, the Yayoi people brought cultural influences from China and Korea. Their artifacts had a powerful effect on the development of Japanese art by presenting objects to imitate and copy, such as bronze mirrors and swords in the Chinese and Korean styles. Yayoi pottery was simply decorated and is thought to have been produced on a potter’s wheel, as opposed to poetry from the earlier Jōmon period which was produced by hand. Pottery from the Yayoi period also tends to be smoother than that of the Jōmon period and more frequently features decorations made with sticks or combs rather than rope. 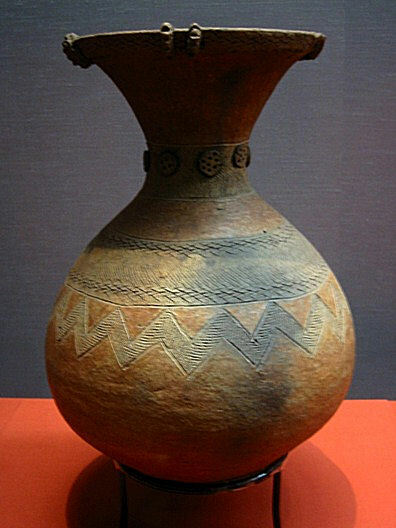 Yayoi pottery, burial mounds, and food preservation have been discovered to be very similar to the pottery of southern Korea, suggesting the Yayoi people originated in the Korean peninsula; some pieces of Yayoi pottery also clearly show the influence of Jōmon ceramics. 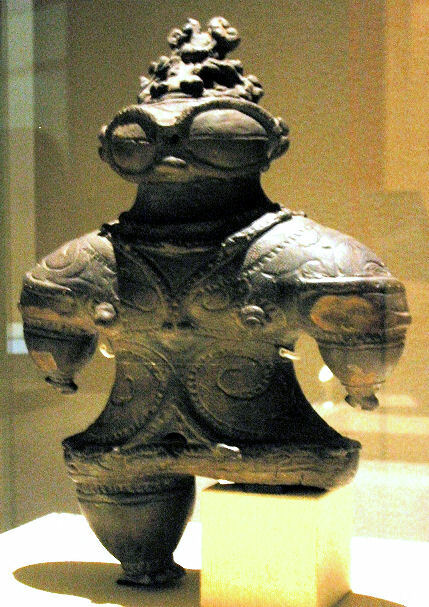 Chinese influence on the Yayoi culture can be seen in the bronze and copper weapons and other objects of the Yayoi people, as well as irrigated paddy rice cultivation. Three major symbols of Yayoi culture include the bronze mirror, the bronze sword, and the royal seal stone. Yayoi craft specialists also made bronze ceremonial bells known as dōtaku. By the 1st century CE, Yayoi farmers began using iron agricultural tools and weapons. A Yayoi period dōtaku bell, 3rd century CE: Yayoi craft specialists made bronze ceremonial bells known as dōtaku. The Kofun period is the oldest era of recorded history in Japan, characterized by its earthen burial mounds. The Kofun period from 250 to 538 CE is the oldest era of recorded history in Japan. It is characterized by the Shinto culture that existed prior to the introduction of Buddhism . During the Kofun period, the leader of a powerful clan won control over much of west Honshū and the northern half of Kyūshū, eventually establishing the Imperial House of Japan. The word kofun is Japanese for the type of burial mounds dating from this era, whose size reflected the power and influence of the ruling classes. The mounds contained large stone burial chambers and some were surrounded by moats. Unglazed pottery figures called Haniwa were often buried under the circumference of the kofun. Kofun come in many shapes, but round and square are most common. A distinct style is the keyhole-shaped kofun with its square front and round back. Kofun range in size from several meters to over 400 meters in length. Shinto: The indigenous spirituality of the people of Japan. Buddhism: The religion and philosophy founded by the Indian teacher Gautama Buddha. kofun: The name of the earliest recorded period in Japanese history, named for the type of burial mounds dating from this era. 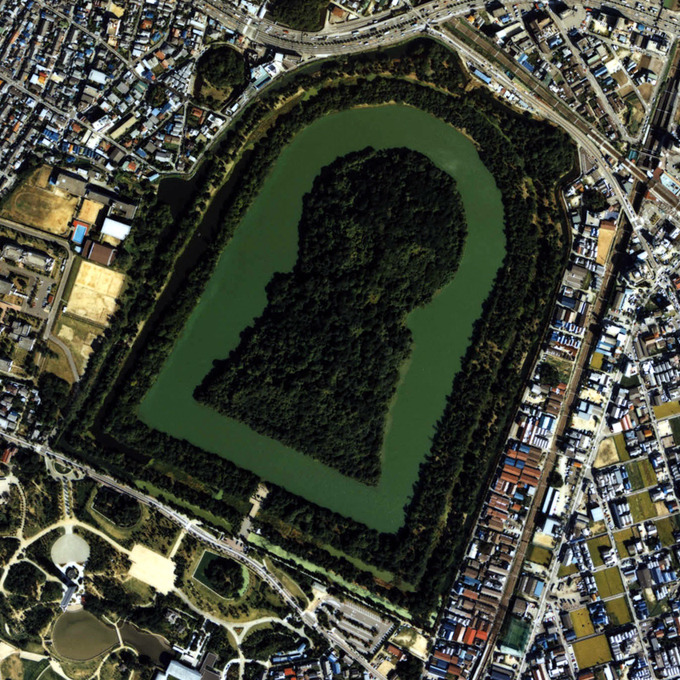 The Kofun period is the oldest era of recorded history in Japan, dating from around 250 to 538 CE. It followed the Yayoi period in Japanese history; the Kofun and the subsequent Asuka periods are sometimes referred to collectively as the Yamato period. The word kofun is Japanese for the type of burial mounds dating to this era. The close of the Kofun period saw the introduction of the Chinese system of writing as well as the widespread adoption of Buddhism. Megalithic Tomb from the Kofun Period: Daisen Kofun, the largest of the earthen burial mounds from the Kofun period in Japan. The Kofun period is distinguished from the following Asuka period by several cultural elements.The Kofun period is characterized by the Shinto culture that existed prior to the introduction of Buddhism. Politically, the leader of a powerful clan won control over much of west Honshū and the northern half of Kyūshū, d eventually establishing the Imperial House of Japan. Kofun burial mounds on Tanegashima and two very old Shinto shrines on Yakushima suggest that these islands were the southern boundaries of the Yamato state. Its northernmost extent was as far north as Tainai in the modern Niigata Prefecture, where mounds associated with a person linked to the Yamato kingdom have been located. Kofun (from Middle Chinese kú, meaning “ancient”, and bjun, meaning “burial mound”) are the burial mounds built for the people of the ruling class during the 3rd to 7th centuries in Japan. The Kofun period takes its name from these distinctive earthen mounds, which contained large stone burial chambers. Some were surrounded by moats. Kofun come in many shapes, but most commonly round and square. A distinct style is the keyhole-shaped kofun, with its square front and round back. Kofun range in size from several meters to over 400 meters in length, and unglazed pottery figures called Haniwa were often buried under the circumference of the structures. The oldest Japanese kofun is Hokenoyama Kofun located in Sakurai, Nara , which dates to the late 3rd century. In the Makimuku district of Sakurai, later keyhole kofuns (including Hashihaka Kofun and Shibuya Mukaiyama Kofun) were built around the early 4th century. The trend of the keyhole kofun first spread from Yamato to Kawachi (where very large kofun such as Daisenryō Kofun exist) and then throughout the country (with the exception of the Tōhoku region) in the 5th century. Keyhole kofun disappeared later in the 6th century, probably because of the drastic reformation which took place in the Yamato court; records suggest the introduction of Buddhism at this time. The last two great kofun are the Imashirozuka Kofun of Osaka, which is believed by current scholars to be the tomb of Emperor Keitai, and the Ikatoyama Kofun of Fukuoka, recorded in Fudoki of Chikugo to be the tomb of Iwai, the political archrival of Keitai. 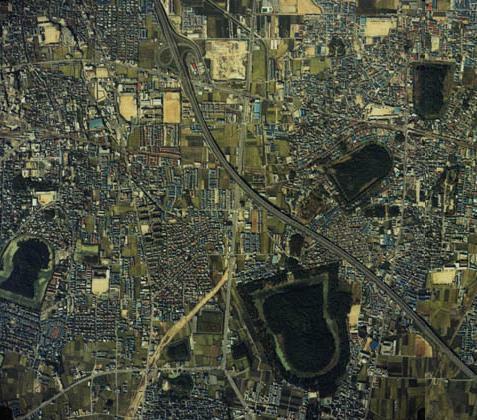 Aerial Photo of Notable Kofun Group: The Furuichi kofun group in Osaka.